A mirror lens for your Fujifilm camera! The Samyang Reflex 300mm f/6.3 ED UMC CS Lens is a mirror lens designed specifically for use on Fuji X System mirrorless cameras. Sporting a compact and lightweight build, considerably smaller than a traditional 300mm lens, the lens’ Cassegrain design enables it to achieve a 450mm 35mm-equivalent focal length perspective. 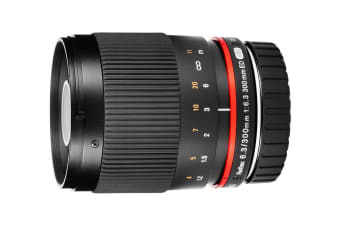 This is a strong and powerful lens with a long focal length, ideal for sports, nature and wildlife photography. The lens comes equipped with an optical structure consisting of 9 elements, arranged in 6 groups, including one ED-type lens to provide high contrast and reduce chromatic aberration. UMC Multicoated optics assist in reducing surface reflections, as well as ghosting and flare.